We’ve all heard the expression, ‘everything is bigger in Texas.’ After getting a sneak peak of the new DREAM sculpture in Arlington, Texas, it looks like dreams are no exception! The unveiling and dedication for this 54′ long, 12′ tall, metallic LED-lit piece adjacent to Levitt Pavilion Arlington will take place tonight at 7 p.m., in conjunction with the annual South Street Art Festival and a lively performance by folk rocker Luke Wade at Levitt Arlington. Today Arlington, Texas is home to over 370,000 residents and host to 8 million visitors a year. After spending the majority of the 20th century widely known as a bedroom community for nearby Dallas and Fort Worth, Arlington has blossomed into a city with a strong identity and a rich civic life. This decision inspired the momentum behind DREAM. As Bob Pruitt—the photographer, entrepreneur and driving force behind the project—explained, “The selection of the word ‘dream’ for the sculpture happened organically, right here in Arlington.” He went on to attribute the use of ‘dream’ to the City’s new identity. Artists, Laura Kimpton (Marin County, Calif.) and Jeff Schomberg (Reno, Nev.)—the creative duo behind DREAM—have collaborated on a series of ‘BIG WORD’ art projects that have been viewed and photographed by millions of people worldwide. DREAM will be the seventh word in the series, which includes BELIEVE (2013)—recently purchased by Reno, Nev.,—and LOVE (2011)—purchased by Paradise Ridge Winery in Sonoma County, Calif.—as well as Burning Man favorites like EGO (2012) and OINK (2010) . 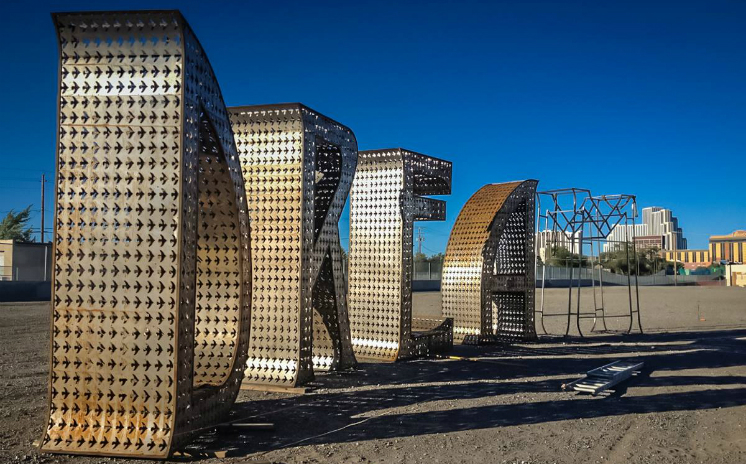 Together they’ve constructed each of DREAM’s five 12′ tall x 4’ deep x 8’ to 10’ wide letters out of heavy sheet metal (with bird-shaped cutouts to reduce weight), around a rigid tubing support structure. 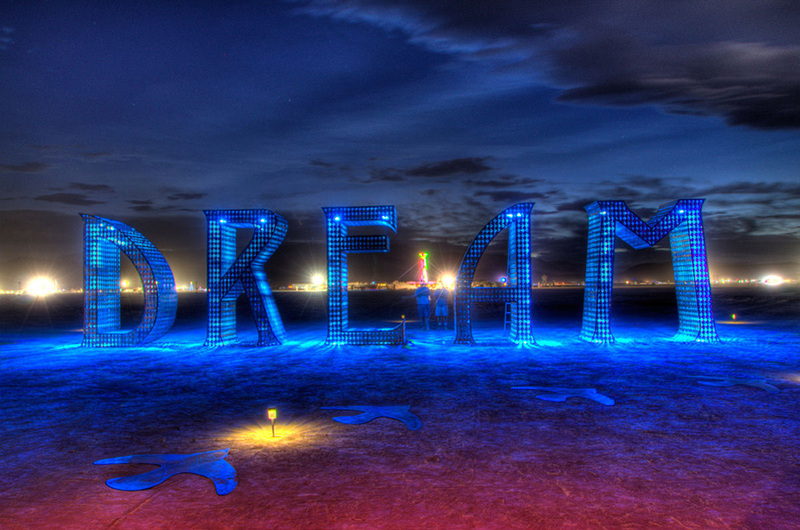 Before journeying to downtown Arlington, DREAM was on display at the annual Burning Man festival in the Black Rock Desert of Nevada. Over the past week, installation crews have been working to bring the piece to life in its new home—the grassy lawn just west of Founders Plaza and Levitt Arlington (100 West Abram Street) in Arlington’s downtown. It will remain here for the next 18-24 months until a permanent, central location in downtown Arlington is agreed upon. True to the nature of public art, this piece is free and accessible to the public. Furthermore, viewers are able to customize their own experience using a mobile device app that remotely adjusts the color of the piece’s many LED lights. Come out to Levitt Arlington tonight to experience yet another night of free, live music under the stars, in addition to the annual South Street Art Festival and the unveiling of a larger-than-life reminder to DREAM big (especially when in Texas…). This entry was posted in Arts Access, Beyond Levitt, Placemaking and tagged Jeff Schomberg, Laura Kimpton, Levitt Arlington, public art on September 25, 2015 by Nicole McGaffey.